Anna Stecksén was one of the early female doctors, and the first woman in Sweden to defend a doctoral thesis in medicine. Anna Stecksén was born in 1870. She was the daughter of Magdalena Christina Hjertman and Major General Johan Adolf Billdau Stecksén. Her father had rather radical views on the place of women in society. He was a board member of Högre lärarinneseminariet (the advanced teacher training programme) in Stockholm and encouraged his daughter to gain a thorough education. After graduating from Lyceum för flickor in Stockholm in 1889 Anna Stecksén decided to enter one of the professions of most status, that of becoming a doctor. She received her medical licentiate in 1897 and became one of only a dozen female doctors in Sweden. Three years later, having completed further studies in Tübingen and Paris, which she financed herself and where she undertook the groundwork for her research, she became the first Swedish woman to defend a thesis in medicine. 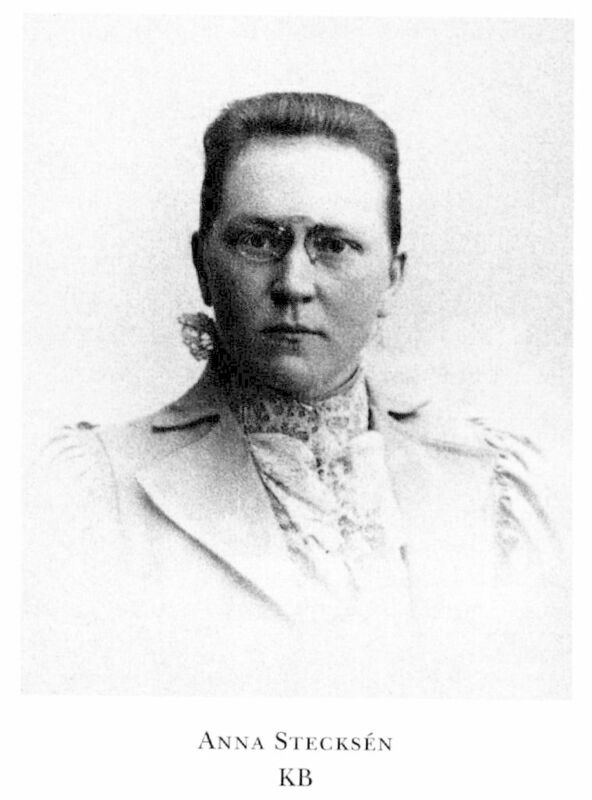 The majority of female doctors tended to become gynaecologists as that specialism was considered particularly suited to the female disposition, but Anna Stecksén specialised in pathology. The subject of her thesis was the cause of cancer illnesses, which she may have chosen as the result of losing two close relatives to cancer. Although her research did not produce definitive results Anna Stecksén believed that an explanation of cancer could be found in the so-called blastomycosis theory which argued that cancer was caused by a type of parasite belonging to yeast family. Stecksén’s thesis was viewed as interesting and was awarded an average mark. On the path to her disputation Stecksén was supported by several male colleagues, including Curt Wallis, professor of the pathology department at the Karolinska institute, who made a workplace and material available to her. Anna Stecksén continued working in pathology and published articles on malaria and on the body’s defences against bacteria. She investigated the possibilities of yeast derivatives as medication and wrote a manual for autopsy techniques. She presented her research results as lectures to the Svenska Läkaresällskapet (the Swedish medical society), amongst others. She also taught healthcare and sexual hygiene at girls’ schools in Stockholm. The doctor Karolina Widerström, a pioneer in sexual hygiene, believed that Anna Stecksén’s teachings had contributed to ensuring the success of the subsequent reforms introduced in the field. In 1902 Anna Stecksén travelled to Finland with the help of stipends from the Fredrika-Bremer-Förbundet and the Karolinska institute. Shortly thereafter she suffered from an infection which forced her to cut the visit short. Before the journey she had applied for a laboratory post at the Karolinska institute, but she subsequently withdrew the application and moved, together with her father and sister, to Södertälje as it seemed to offer an environment more conducive to her poor health. Despite this, the infection continued to ravage her body and she died in 1904. Anna Stecksén has been described as determined and highly scientifically motivated, but due to her untimely death she did not advance very far in her research. As one of the very few female doctors she did, however, play a vital symbolic role at a time when women’s rights to education and to having a career – particularly within what was seen as a male sphere – was far from self-evident. In addition to her activities within research and teaching she was also interested in art and literature and was herself artistically talented. Anna Stecksén is buried at Norra cemetery in Solna. Anna Magdalena Stecksén, www.skbl.se/sv/artikel/AnnaStecksen, Svenskt kvinnobiografiskt lexikon (article by Lena Milton), retrieved 2019-04-24.